Two weeks ago, REDD-Monitor wrote about a report by Datu Research on the beef industry in the Brazilian Amazon. 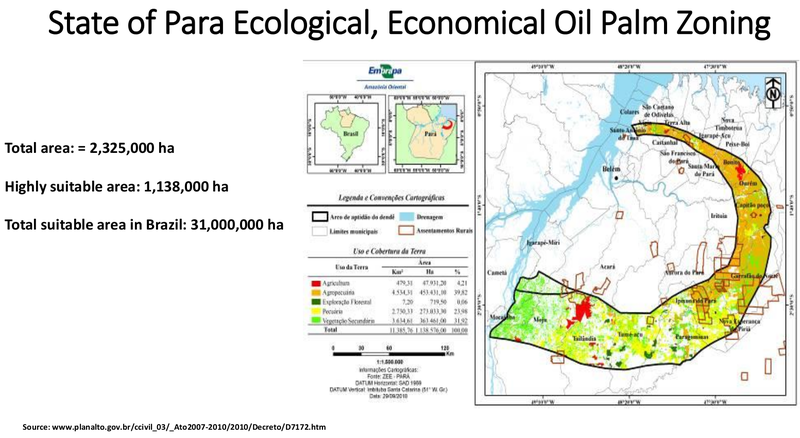 The report also looked at a potential new threat to Brazil’s forests, the expansion of oil palm plantations. I don’t know where you got your information about the oil palm developments in Brazil, but I am sorry to say they are all wrong. The total oil palm plantation in the entire Amazon region is 161,000 ha, so there is no way to reach 322,000 ha by next year as you assure. Brito offered to send the “real and trusted information” from the Brazilian Palm Oil Association when he returned from the Round Table on Sustainable Palm Oil meeting. b. No deforestation. No area deforested after 2008 can be used for oil palm plantation. 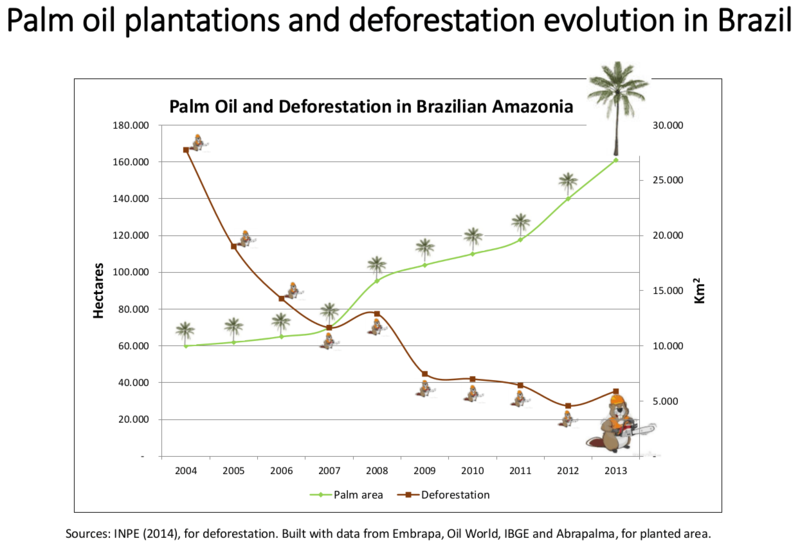 The picture 2 below shows that are no link between oil palm developments and the deforestation rate in Brazil. As you can see, the relation between oil palm developments goes contrary to the rate of deforestation. In numbers not yet consolidated, in 2014 we are watching the growth on deforestation in the same time new oil palm plantations reached the slowest rate in the past 6 years. c. Labor cost. Labor is the number one cost for any oil palm plantation anywhere in the world. This varies from 25 to 60% out of the total cost of one tone of crude palm oil (CPO). 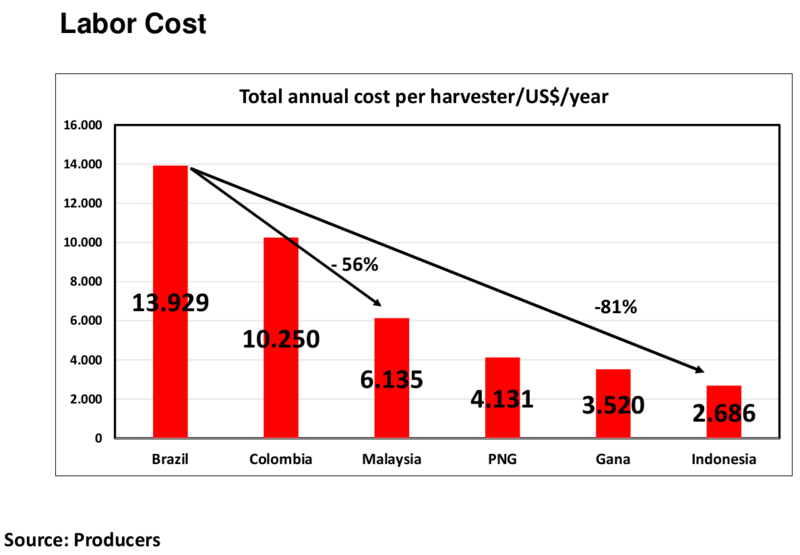 Brazil has the highest labor cost among the 44 oil palm producing countries. Please see picture 3.
d. Competition with foreigner producer. Nowadays Brazil imports more palm products than what is locally produced. The simple reason is cost. Production in Brazil is geographically located at the State of Para, 3,000 km away from the main consumer area that is the southeast of the country. Freight cost stands up to US$ 200/ton against US$ 65/ton for oil coming from Colombia, Malaysia and Indonesia. Please see picture 4. In resume, despite all the good climate condition, land offer, millions of deforested land and man power, Brazil has not the economical attractiveness the sector needs to invest here. We do believe in a future we’ll be a medium size and important producers, but only after cheap areas for new developments as Asia and Africa become out of the scope. This is all well and good, BUT Brazil is notorious for having a lot of regulations and incentives for various industries to preserve forest land with set asides, etc that aren’t enforced and routinely violated often with relative impunity. So why would it be any different with the palm oil industry especially with so much government corruption in Brazil?